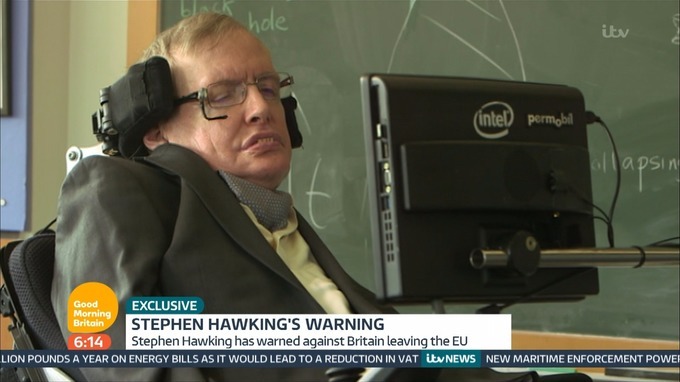 Professor Hawking [Image: ITV/Good Morning Britain]. Indeed. If you must insist on casting your vote according to personalities, at least cast it in support of someone who has a personality. Stephen Hawking has warned against Britain leaving the EU saying it would make us more “isolated and insular”. The theoretical physicist told Good Morning Britain that the UK needed to stay in the EU to protect its scientific research being undermined by Government austerity cuts. Professor Hawking also warned that Britain would be “ultimately more remote from where progress is being made”. [He said:] “Gone are the days we could stand on our own against the world. We need to be part of a larger group of nations both for our security and our trade. The Cambridge scientist said the mobility of people and grants given by the European Research Council to UK institutions were important reasons for Britons to vote to remain in the bloc on June 23. “There are two obvious reasons why we should stay in. The first is that it promotes the mobility of people. Students can come here from EU countries to study and our students can go to other EU universities. More importantly, at a level of research the exchange of people and able skills to transfer more quickly and brings new people with different ideas. Without this exchange, we would become more culturally isolated and insular and ultimately more remote from where progress is being made. Stephen Hawking has a terrific brain and intellect. Gove has only got extremely bigoted and nasty ideas. I’ll vote Gove, most defo the lesser of two evils. Gove is certainly lesser. Lesser intellect, lesser authority… lesser impact, I’d hope. In fact, the only area in which he is greater is evil. The difference between Stephen Hawking and Michael Gove? Hawking has a massive intellect and what he says is always logical. Gove has no discernable intellect and what he says is always laughable. I support the remain campaign, but have criticized Stephen Hawking in the past for failing to speak out about the welfare crisis impacting Britain’s sick and disabled. Stephen Hawking thinks first and doesn’t work on fiction. Gove is thinking about filling his pockets only.